Infante Jaime of Spain, Duke of Segovia, Duke of Anjou, RE (Jaime Leopoldo Isabelino Enrique Alejandro Alberto Alfonso Víctor Acacio Pedro Pablo María de Borbón y Battenberg) (23 June 1908 – 20 March 1975), was the second son of King Alfonso XIII of Spain and his wife Princess Victoria Eugenie of Battenberg. He was born in the Royal Palace of La Granja de San Ildefonso in Segovia Province. 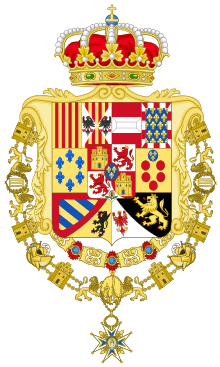 Because he was deaf, as the result of a childhood operation, he renounced his rights to the Spanish throne for himself and his descendants on 21 June/23 June 1933. He was then created the title for life of Duke of Segovia by King Alfonso XIII. 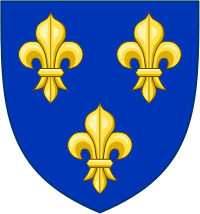 After his father's death in 1941, he proclaimed himself the senior legitimate male heir of the House of Capet, heir to the French throne, and head of the House of Bourbon. He then took the title of Duke of Anjou and became, in the opinion of French legitimists, the de jure King of France. 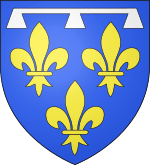 He was known to most French legitimists as Henri VI, though to a minority as Jacques II (after 1957, he signed all documents as Jacques Henri). In 1921, he became the 1,153rd Knight of the Order of the Golden Fleece and Knight with Collar of the Order of Charles III and Grand Cross of the Order of Isabella the Catholic both in 1925 (Collar of the Order of Isabella the Catholic in 1931). Alfonso, Duke of Anjou and Cádiz (20 April 1936–20 January 1989) he married María del Carmen Martínez-Bordiú y Franco on 8 March 1972 and they were divorced in 1986. They have two sons and three grandchildren. Gonzalo, Duke of Aquitaine (5 June 1937–5 March 2000) he married, Carmen Harto on 18 April 1983. He remarried Maria de las Mercedes Licer on 25 June 1984 and they were divorced on 31 January 1989. He remarried again Emanuela Protalongo on 30 June 1984 and they were separated on 7 March 1986. Gonzalo and Emanuela were also married in a religious ceremony on 17 September 1992. He has an illegitimate daughter and five grandsons. Don Jaime and Emmanuelle de Dampierre divorced on 6 May 1947 in Bucharest (recognized by the Italian courts on 3 June 1949 in Turin but never recognized in Spain) and, on 3 August 1949 in Innsbruck, Don Jaime remarried civilly to divorced singer Charlotte Luise Auguste Tiedemann (Königsberg, 2 January 1919 – Berlin, 3 July 1979), daughter of Otto Eugen Tiedemann and wife Luise Klein. In the eyes of the Roman Catholic Church and of the French legitimists, Emmanuelle de Dampierre remained always his wife. The second marriage produced no children. His first wife remarried in Vienna, on 21 November 1949, to Antonio Sozzani (Milan, 12 July 1918 – Milan, 6 January 2007), son of Cesare Sozzani and wife Cristina Alemani, without issue. On 6 December 1949, Don Jaime retracted his renunciation of the throne of Spain. On 3 May 1964, he took the title Duke of Madrid as head of the Carlist branch of the Spanish succession (recognized as King Jaime IV of Spain by the legitimist group of Carlists who did not support the Borbón-Parma claim after Alfonso Carlos, Duke of San Jaime died in 1936). On 19 July 1969, Don Jaime definitively renounced the Spanish succession in favour of his nephew, King Juan Carlos I of Spain, by petition of his son Alfonso de Borbón. Don Jaime died in St. Gall Cantonal Hospital in Switzerland on 20 March 1975. He is buried at the Royal Monastery of San Lorenzo de El Escorial. ↑ "ROYALTY: A Wonderful Woman". Time. 2 January 1950. Retrieved 2011-05-25. Spain's 41-year-old Don Jaime de Bourbon, Duke of Segovia, born deaf & dumb, has always led the quiet life, devoted himself intently to lip reading and to learning to talk which he now does, blurrily but intelligibly, in three languages. The elder of the late King Alfonso's two living sons, he gave up his rights to the Spanish throne 16 years ago in favor of his healthy younger brother Juan, and set off in pursuit of the happiness that has traditionally eluded his hemophilic Bourbon family. ↑ Preston, Paul (2004). Juan Carlos: Steering Spain From Dictatorship To Democracy. New York, NY: W. W. Norton & Company. p. 4. ISBN 978-0393058048. Retrieved 2011-05-25. In Fontainebleau, 21 June 1933, Don Jaime, who was single at the time, finally agreed to renounce his rights to the throne, as well as those of his future heirs. The renunciation was irrevocable and would be ratified on 23 July 1945. ↑ Política nacional, ABC, 8 december 1925. Accessed 2012-11-13. ↑ "Milestones, Mar. 11, 1935". Time. 11 March 1935. Retrieved 2011-05-25. Married. Don Jaime, 26, second son of ex-King Alfonso XIII of Spain; and Emanuela de Dampierre. 20, granddaughter of Princess Ruspoli Poggio di Suasa, (née Josephine Curtis of Boston); in Rome. Born a deaf-mute, Don Jaime has learned to speak croakingly. ↑ "Milestones, Aug. 15, 1949". Time. 15 August 1949. Retrieved 2011-05-25. Married. Don Jaime, 41, Duke of Segovia, second son and onetime heir apparent of ex-King Alfonso XIII of Spain (deposed 1931, died in exile 1941), who renounced his claim to the throne in 1933; and Charlotte Tiedemann, German opera singer; in Innsbruck, Austria. Born a deaf mute into a family racked by the "Bourbon curse" of hemophilia, Don Jaime learned to talk intelligibly in three languages, remains healthy. ↑ Bergamini, John D (1974). The Spanish Bourbons: The History of a Tenacious Dynasty. New York, NY: Putnam. p. 392. ISBN 978-0399113659. Retrieved 2011-05-25. Zavala, José M. Don Jaime, el trágico Borbón: la maldición del hijo sordomudo de Alfonso XIII. Madrid: La Esfera de los Libros, 2006. ISBN 8497345657. Aranguren, Begoña. Emanuela de Dampierre: memorias, esposa y madre de los Borbones que pudieron reinar en España. Madrid: Esfera de los Libros, 2003. ISBN 8497341414.